As writer Justin Murphy so eloquently puts it in his forward to CLEBURNE, "In these pages, you will meet a man who is virtually unknown to the general public: an idealist and an outsider who stood up against the institutions of the very society he sought to defend." Indeed. I had never heard of General Patrick R. Cleburne before reading this graphic novel. Cleburne was a highly decorated officer in the Confederate army during the Civil War, inspiring heroics and bravery from his men during brutal campaigns against the Union troops. But I came away inspired by the tale of this man who was a pioneer in wanting to free blacks from slavery, if only to fight for the Confederate Army in return for freedom. Cleburne, of course, was rebuffed by other generals, who thought the idea of giving black slaves their freedom was tantamount to rebellion and thwarted Cleburne at every turn. This graphic novel, which Murphy openly states is a mix of fact and fiction, takes place over the course of the year of 1864 that leads up to Battle of Franklin in which General Cleburne is finally shot and killed on the battlefield. In between, he finds love and works to reunite a free black volunteer in his battalion with his enslaved family and tries to bring honor to the cause, which he believes is not about slavery (which he considers immoral) but about the rights of states to govern themselves with as little federal interference as possible (an issue that still resounds today). Cleburne was a transplant from Ireland whose outsider status allowed him to view the issues differently from the other generals in his midst. I also found it fascinating to read a story about the Civil War from the view of the South. So much of history that I have come across about that period of time is told from the North's view and we forget that there were many layers to the conflict and that honor could be found on both sides. 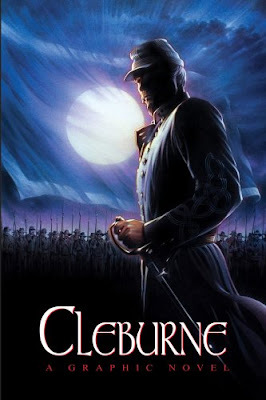 CLEBURNE is an excellent example of a story well-told that opens an important window into a forgotten hero of the Civil War whose heart and valor led the way forward, if only to eventual defeat. The artwork here is excellent and rich with color and detail. The nuances of the illustrations really bring the characters to life and they wear their emotions on their sleeves during scenes of panic, war, love and friendship. The battle scenes are quite vivid, and for younger readers, it might be a bit too much blood and gore and violence. Justin Murphy, along with the art team of Al Milgrom and J. Brown, demonstrate the horrific nature of war in the aftermaths of the battles and the reader is left feeling quite abandoned and lonely by the overwhelming death and destruction left in the wake of the violence. This graphic novel has great value to any study of the Civil War. It gives the reader another view into the conflict, showing fully-developed characters that move beyond the stereotypical depictions of southern generals. While one may not always agree with the rationale or basis for the Civil War, this book provides a valuable insight into the slow course of change and how one man can use his moral authority to begin to sway the thoughts of others. The story also shows the impact of war on the homefront, as Cleburne's fiancee waits and waits for him to arrive safe so that they can get married, only to learn of his death on the battlefield through the headlines of the local newspaper. The anguish on her face tells more about that moment of realization than words could ever say. The book also begs the question: what other heroes become forgotten when the victor (in this case, the North) gets the power to tell the story of a conflict? How does that change our understanding of a conflict? Of history? A possible research project might involve learning more about a lesser known character from the Civil War and mesh fact and fiction to create a short story or graphic story. I would Highly Recommend this book, but only for older high school readers. The violence of the Civil War is vivid and the story depth makes it inappropriate for younger readers.